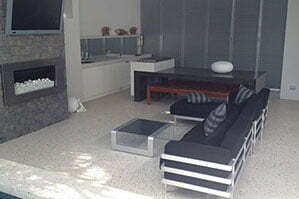 McGinn Concrete has over 25 years experience in applying the perfect concrete finish to all projects. 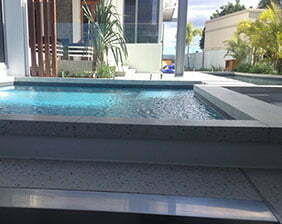 McGinn Concrete upholds a professional and expert reputation in delivering domestic, commercial and industrial concrete works across Brisbane and South East Queensland. With a stunning selection of samples from around Brisbane, Sunshine Coast and Gold Coast, McGinn Concrete can recommend and apply the most suitable concrete finish for your interior and/or exteriors projects. To help you understand the large variety of concrete finishes available and how to apply them to your project, view the finishings range below or contact the team at McGinn Concrete to discuss. You’ve probably noticed that concrete flooring has been used in industrial spaces for many years, but recently it has also become extremely popular in modern homes, retail spaces and offices. Polished concrete from McGinn’s Concrete is versatile, durable and easy to maintain and comes in a variety of finishes making it the perfect choice for decorative flooring. making rooms more spacious as it allows light to reflect off the shining surface. easy to clean and maintain – naturally, dirt and dust won’t stick to the polished concrete flooring, making it easy to clean and with no need to use harmful chemicals on your floor. This is also particularly good news for asthma and allergy sufferers. As polished concrete can be used as decorative flooring as well as a structural surface, there are specific placement and finishing techniques required to ensure a quality finished project. Because of this, McGinn Concrete have a team of experienced trades people specialising in the placement, polishing and sealing of polished concrete flooring. McGinn concrete works in partnership with Boral Concrete, Excel Group, Hanson and CCS to give our customers the widest choice possible in creating their special design. These companies have display stands in our showroom in Kingston, so please come and marry up some samples and start creating your dream design. Alternatively, you can download the product brochure of each company by clicking on the company name above. For a look at the complete range of polished concrete and to find the combinations you want to complete your project, talk to a member of our skilled showroom team to custom create your very own mix design! Exposed aggregate concrete refers to the various types of aggregates (materials) that appear in the concreting mix to create unique looks and styles and perfect for any interior or exterior project. Exposed aggregates appear in both polished concreting adding texture and style to the polished look, and outdoor concreting perfect for an attractive slip-resistant texture ideal for pool surrounds, paths and driveways. McGinn Concrete exposed aggregate finishes are well priced, and have an unmatched range of amazing styles and colours that will match or enhance any area around your residence or commercial property. There are various ways of producing an exposed aggregate concrete finish including; water washing, abrasive blasting, acid etching & stencil blasting. McGinn Concrete suggests that the most common technique for producing exposed aggregate concrete finishes is via the “water wash off technique”. This technique removes the cement matrix at the surface of the concrete slab using brushing & flushing of the surface with water soon after the poured concrete has stiffened. All you have to do to clean and enhance the appearance of McGinn Concrete exposed aggregate is to use an acid wash and concrete sealer to protect the exposed aggregate concrete from stains. It’s that easy! 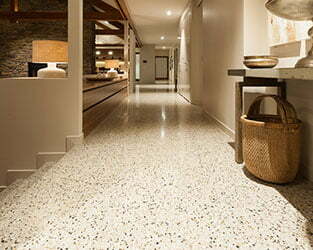 You can also choose a number of aggregate types to complete your customised look. McGinn Concrete partner with Boral so to view Borals range of aggregates, visit their product range here. Usually, for structural concrete in home building the maximum aggregate size is 20mm. We use 10m concrete mixes for more specific jobs like block-work core fill or paving slabs. To create an even more unique look, you can add the aggregates to white cement rather than the standard grey and can also add liquid dyes or powdered ochres to the mix to create more contrasts in the concrete. The team are happy to show you some different options and recommend some looks for your project so call today. Imagine having a beautiful floor that flows seamlessly from your interior floors and outside to your entertainment area. If you love the look of a contemporary, designer floor that is hard wearing and can match into your interior spaces, then talk to the team at McGinn Concrete about the versatile honed concrete finish. For interior Honed & Sealed Concrete we grind to 120 Grit and grout the surface to improve the overall shine of the floor. We recommend using 2 base coats of IBS LD1000 acrylic water-based sealer to enhance the colours within the floor, we then apply 3 coats of IBS stainless acrylic water-based sealer which prevents any stain penetration, to finish the floor we then add 3 coats of high gloss IBS premier sealer thus giving the floor a high shine. McGinn Concrete recommends honed concrete, a slip-resistant concrete finish, for not only entertaining areas but your patios, around the pool or even on driveways. Because McGinn honed concrete is ground to a course cut allowing for slip resistance this concrete finish is also suitable for industrial and commercial use, for walkways, commercial foyers, and all public access areas. Contact McGinn Concrete for more information or for a free quote on your project. Husqvarna Hiperfloor™ is a revolutionary flooring concept for the grinding and polishing of old and new concrete floors. Through market-leading R&D strategies, Husqvarna has combined advancements in planetary floor grinders, floor treatment products and the latest resin diamond technologies to create a system whereby new and old concrete floors can be transformed into highly abrasion-resistant, incredibly dense, smooth and visually appealing surfaces. Husqvarna Hiperfloor™ substantially reduces the need for epoxy or thin film coatings, providing a surface that can withstand even the toughest traffic. Over the lifetime of the floor, the end result is incredible longevity, performance, shine and beauty, low maintenance and a very cost-effective flooring alternative. Hiperguard™ Premium Enhance can be applied to the surface at the end of the process to make the concrete significantly more resistant to fats, oils, water and acids. The Hiperfloor™ process is odourless and relatively quiet meaning application can be worked around your requirements without any need to vacate. No downtime, no lost earnings and minimal inconvenience. Full depth coloured concrete is a widely used option for driveways and any external areas, not only is it a durable surface but also provides you with a choice of wonderful earthy tones. In addition to its beauty coloured concrete is installed quickly, easy to maintain and a cost-effective way of creating your dream design, whether you want it shaped, polished, exposed or just a mirage of colours. McGinn Concrete only installs full depth colour rather than painted or topped colour, thus fading and re-colouring are no longer issues. 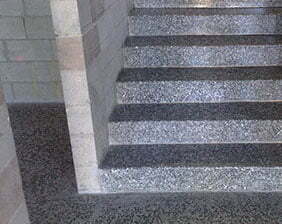 McGinn Concrete also recommends sealing your coloured concrete areas with an ultraviolet stable sealer. These sealers come in many finishes from gloss through to matt, including hard-wearing sealers for high traffic areas. In sealing your coloured concrete you ensure that the area is protected from absorbing stains and also makes the surface easy to keep clean. You’ll find more information and inspiration at Boral’s Colori gallery and once you’ve had a look, call the team at McGinn’s to chat about the next steps. It’s no secret that stenciled concrete looks fabulous on a driveway, but did you know it can be used around your pool, patios, entrance ways, courtyards and/or footpaths? McGinn Concrete use a high quality disposable stencil for creating different decorative effects. Stencilled concrete is very similar to stamped concrete, with the important difference being that this process utilises disposable paper stencils to print the pattern, instead of rubber mats. There are a range of options available to suit your project and desired look. Plain concrete is quite common for concrete projects and simply refers to the grey smooth concrete finish. 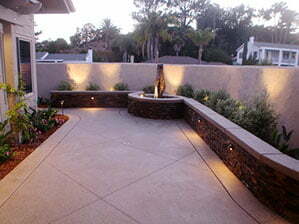 Plain concrete is used for slabs, some pathways and driveways and is durable and low to no maintenance. For a slight textured finish on plain concrete, you could add a broom decorative finish as described below. McGinn Concrete believe that the Broom finish is an attractive, slip resistant texture and is easy to achieve by pulling a damp broom across the concrete surface. Fine or medium textures are commonly used to produce slip resistant surfaces on external areas such as entertainment areas, garages, shed floors and gently sloping and flat walking paths and driveways. The team at McGinn’s can apply textured finishes in many ways for example, using straight or curved lines, with driveways and pathways typically broomed at right angles. Broom finish is an ideal ‘do it yourself’ concrete finish for the home handy-man, or if you don’t have enough time, contact McGinn Concrete on (07) 3451 7900.